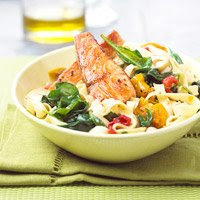 Another "Quick & Easy Spring Dinners" recipe from BHG. 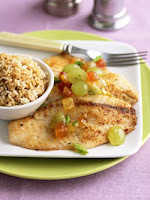 If grape chutney is a little too weird for you, just skip it and serve the fish with a salad. 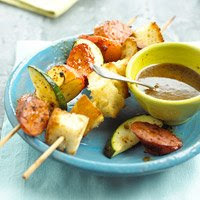 For a nice twist, try cooking the kabobs on the grill. 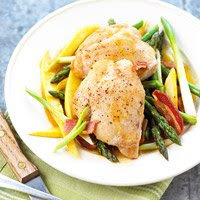 Another "Quick and Easy Spring Dinner" recipe from BHG. Save money by using a can of sliced pineapple. You'll sacrifice a bit of the fresh taste, but money's tight when you have little ones! And cut down on the heat by removing the seeds from the jalapeno ... or just leave it out. 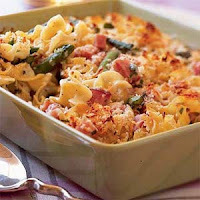 I received an e-mail from Better Homes and Gardens that included several recipes for "Quick and Easy Spring Dinners." I thought I would post the MSPI-friendly recipes. This recipe includes one of my favorite flavor-packed ingredients: bacon! Have you ever had broiled asparagus? It's super easy and so yummy! This recipe from Cook's Illustrated includes a vinaigrette for the asparagus, but the asparagus is great even without it. Just season to taste with extra olive oil, salt and pepper. Adjust oven rack to uppermost position and heat broiler. Toss asparagus with oil and salt and pepper, then lay spears in single layer on heavy rimmed baking sheet. Broil about 4 inches from heating element, shaking pan halfway through to turn spears, until asparagus is tender and lightly browned, 8 to 10 minutes. Cool asparagus 5 minutes and arrange on serving dish. Whisk shallot, lemon juice and zest, thyme, mustard and olive oil in small bowl; season to taste with salt and pepper. Drizzle over asparagus and serve immediately. With the spring weather upon us, my cooking heads outdoors to the grill. Flank steak is a relatively inexpensive steak that handles marinades and rubs incredibly well, but who has time to marinate for hours? Here's a recipe from Cook's Country that skips the marinating but still packs a lot of flavor. Combine parsley, onion, garlic, vinegar, oil, pepper flakes, and salt and pepper to taste in small bowl. Season steak with salt and pepper to taste. Grill steak over very hot fire until browned on both sides and slightly less done than you want, about 10 minutes. Place steak in baking dish and coat with parsley sauce. Cover dish with foil and let rest for 5 minutes. Slice steak thinly against grain and serve with sauce remaining in baking dish. Most casseroles are a big no-no when avoiding dairy, but here's a recipe from Taste of Home that's dairy-free! Break this one out the next time you want some comfort food! Here's an easy salad recipe from Taste of Home you can throw together when dining alone. You can easily double, triple or quadruple the recipe when cooking for others or if you want leftovers. Tip: Next time you cook some chicken breast for dinner, save some for this recipe or use a can of cooked chicken when in a pinch. I haven't had a chance to make this recipe from Campbell's Kitchen, but it looks nice and easy -- which is always a plus for busy moms! Love that slow cooker! Next time you're strapped for time, reach for Tyson Chicken products. I have yet to come across one of their traditional products that isn't MSPI-friendly, such as chicken nuggets and breaded chicken strips. Obviously, avoid the meals and items that are stuffed or have sauce. And as always, double check the ingredients to make sure it is safe! This recipe from Cook's Illustrated is a nice twist on unhealthy french fries. Take care to cut the potatoes into evenly sized wedges so that all of the pieces will cook at about the same rate. Adjust oven rack to lowest position; heat oven to 475 degrees. Place potatoes in large bowl and toss with one tablespoon oil; soak 10 minutes. Meanwhile, coat 18 by 12-inch heavy-duty rimmed baking sheet (see note) with 4 remaining tablespoons oil and sprinkle evenly with 3/4 teaspoon salt and 1/4 teaspoon pepper; set aside. Arrange potatoes in single layer on prepared baking sheet; bake until bottoms of potatoes are spotty golden brown, about 25 minutes, rotating baking sheet after 10 minutes. Using metal spatula and tongs, scrape to loosen potatoes from pan, then flip each wedge, keeping potatoes in single layer. Continue baking until fries are completely golden brown, 5 to 15 minutes longer, rotating pan as needed if fries are browning unevenly. Transfer fries to second baking sheet lined with paper towels to drain. Season with additional salt and pepper to taste and serve. If you like garlic, then this pasta recipe from Cook's Illustrated is for you! For a twist on pasta with garlic and oil, try sprinkling toasted bread crumbs over individual bowls, but prepare them before proceeding with the pasta recipe. Bring 4 quarts water to rolling boil, covered, in large Dutch oven or stockpot. Add pasta and 1-1/2 teaspoons table salt to boiling water, stir to separate pasta, cover, and cook until al dente; reserve 1/3 cup pasta cooking water and drain pasta. While water is heating, combine 3 tablespoons oil, 3 tablespoons garlic, and 1/2 teaspoon table salt or sea salt flakes in heavy-bottomed nonstick 10-inch skillet; cook over low heat, stirring constantly, until garlic foams and is sticky and straw-colored, 10 to 12 minutes. Off heat, add remaining tablespoon raw garlic, red pepper flakes, parsley, lemon juice, and 2 tablespoons pasta cooking water to skillet and stir well to keep garlic from clumping. Transfer drained pasta to serving bowl; add remaining 3 tablespoons olive oil and remaining reserved pasta cooking water and toss to coat. Add garlic mixture and 3/4 teaspoon table salt or 1 teaspoon sea salt flakes to pasta; toss well to combine. Serve immediately. I've been out of town all week visiting my parents -- thus no blogs! I missed it! Anyway, while there I baked this cake recipe from Taste of Home for my mom's birthday. Very yummy! The icing is to die for! It's easily the best part of the cake. Since making the cake is a lot of work, skip making the cake and buy an angel food cake at the store. Then just make the icing! Let eggs stand at room temperature for 30 minutes. In a large mixing bowl, combine the flour, sugar, baking powder and salt. In another bowl, whisk the egg yolks, water, oil, lemon peel and vanilla; add to dry ingredients. Beat until well blended. In another large mixing bowl, beat egg whites and cream of tartar on medium speed until soft peaks form; fold into batter. Gently spoon into an ungreased 10-in. tube pan. Cut through batter with a knife to remove air pockets. Bake on the lowest oven rack at 325° for 50-55 minutes or until top springs back when lightly touched. Immediately invert the pan; cool completely, about 1 hour. Run a knife around side and center tube of pan. Remove cake to a serving plate. In a small mixing bowl, combine frosting ingredients; beat until smooth. Spread over top of cake. Yield: 12-16 servings. 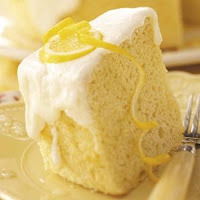 This recipe from "Cake Mix Magic" uses lemon cake mix for the base. Several Duncan Hines cake mixes, including the lemon, are MSPI-friendly. The only change I made was substituting dairy-free margarine for butter. Also, serve the whipped cream on the side for those who can eat it. If berries aren't in season and are super expensive, try using frozen berries that have been thawed. In a 9- by 13-inch cake pan, melt margarine. Sprinkle brown sugar evenly on top. Scatter fruit over sugar. Prepare cake mix according to package directions. Pour batter evenly over fruit. Bake 45 to 50 minutes or until a toothpick inserted in center of cake comes out clean. Let stand 5 minutes, then turn upside down onto a large platter or a cookie sheet. Serve warm with a dollop of whipped cream, if desired. 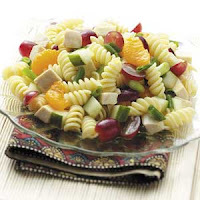 This is a yummy snack mix recipe that I found on the Chex website. Try substituting corn chips (such as Fritos) for the cheese crackers. As always, make sure your taco seasoning mix is MSPI-friendly. I use Ortega brand. Also, the recipe gives directions to prepare the mix in the microwave or the oven. I highly recommend following the oven directions. A simple soup recipe from America's Test Kitchen. Small pasta shapes such as orzo and ditalini work best in this hearty, easy-to-make soup. Look for an "Italian Blend" of frozen zucchini, carrots, broccoli, and beans in your supermarket's frozen section. Bring broth, beans, and tomatoes to boil in large saucepan. Meanwhile, heat oil in Dutch oven over medium-high heat until shimmering. Add onions and cook until softened, about 5 minutes. Add garlic and cook until fragrant, about 30 seconds. Stir in broth mixture and pasta and simmer until pasta is tender, about 10 minutes. Stir in vegetables and basil and cook until heated through, about 2 minutes. Season with salt and pepper. Serve with additional olive oil for drizzling. A nice alternative to traditional salsas. Combine all ingredients and marinate at least two hours. Serve as a salad or with tortilla chips as a dip. 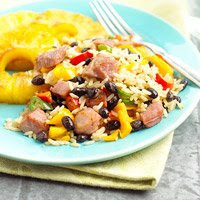 Here's a recipe from Ortega that will have your taste buds saying, "Ole!" Make sure the bread crumbs are MSPI-friendly -- grind your own if necessary. Eliminate the chipotle chiles in adobe sauce and use mild salsa instead of medium if spicy foods bother your baby. 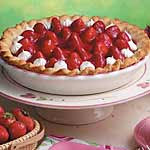 Here's one of my favorite pies to eat when strawberries are in season -- which is right now! The recipe comes from Taste of Home. You can use a pre-made pie crust, just make sure it's MSPI-friendly. Obviously, the whipped topping is out for those of us on the MSPI diet, but you can serve it on the side for everyone else. Another mocktail from "Margarita Mama." Fill a tall glass with ice. Add all the ingredients and stir. Garnish with cherry and pineapple and serve. I read about the cookbook "Margarita Mama Mocktails for Moms-to-Be" by Alyssa Gusenoff in yesterday's newspaper. Since alcohol isn't exactly on the menu for breastfeeding mamas either, I thought I would post a few recipes. Don't you just love it! In the bottom of a tall glass, muddle the mint leaves with the lemonade and cherry juice. Add ice, then pour in the ginger ale. I came across this recipe in the newspaper last fall. The flavor is incredible! The recipe can easily be doubled. Make sure you cover it when you cook; you want the pork and vegetable juices to make a sauce, not to evaporate. Lightly salt and pepper the pork chops. In a lightly oiled, large heavy skillet over medium-high heat, add the pork chops, cover with a tight-fitting lid and cook for 3 to 5 minutes, or until lightly browned. Turn pork chops, cover and cook for 3 to 5 minutes to brown the other side. Meanwhile, peel and chop sweet potato. Place on plate and microwave on high for 3 1/2 minutes to partially precook. Peel and chop onion and apple. When chops are golden on both sides, remove from skillet and set aside. Add sweet potato, onion and mushrooms to skillet and stir to combine. Add 2 to 3 tablespoons water to deglaze pan and make a sauce. Place pork chops on top of vegetable mixture. Reduce heat to medium and cook, covered, for 15 minutes. Have you ever had quinoa? Quin-what? Quinoa (pronounce keen-wah) is a whole grain that's actually high in protein and is gluten-free. It's really quite yummy ... the little grains just look a little odd because each grain has a sprout coming off of it when cooked. The top photo is how it looks prior to cooking. Anyway, give it a try, and this salad from "The Gluten-Free Vegetarian Kitchen" is a great way to do that. If you can't find quinoa, you could probably use rice, couscous or a small pasta with similar results. In a medium saucepan over high heat, combine the water, picante sauce, quinoa, cumin, salt and pepper. Bring to a boil, then reduce heat to medium, cover and cook until the liquid is absorbed, 15 to 20 minutes. Remove from the heat and let stand 5 minutes. Uncover and toss with a fork. Transfer to a large bowl and let cool slightly. Add remaining ingredients to the quinoa, tossing well to combine. Serve slightly warm or let cool to room temperature. Alternatively, cover and refrigerate for up to 2 days and serve chilled. I've been trying to use up some leftover ham, and this recipe from Cooking Light did just that for me! You just need to make a few substitutions for MSPI. Use rice milk instead of the whole milk, use olive oil instead of butter and serve the Parmesan cheese on the side for those who can eat dairy. I also tossed in some sliced mushrooms when I sauteed the onions. Gotta clean out the fridge when you can! My friend Kim passed on a ton of recipes to me from "Dairy-Free, Egg-Free Kid Pleasing Recipes & Tips." Her kids can't have dairy, and her son, Andrew, is allergic to eggs as well. She said this recipe is one of her family's favorites. I love how it sneaks a ton of veggies in! Preheat oven to 375 degrees. Sauté onions and garlic in a little olive oil. Steam or boil your choice of vegetables -- just eyeball the amount, you want to end up with 1 cup of puree. Puree the sautéed onions and garlic and the cooked vegetables in a blender or food processor. In a large glass bowl, mix together the ground beef, breadcrumbs, and pureed vegetables. Spread the beef mixture in a glass pie plate; make a hole in the middle, to collect any grease. Bake for 30 to 35 minutes, or until there is no pink in the middle of the beef round. (This method sure beats the time required for a loaf pan!) As always -- serve with some ketchup and mashed potatoes. My friend Jenny passed this recipe on to me a couple years ago. Much better than anything you buy in the store! You can customize the bars easily by mixing in chocolate chips, raisins, nuts, etc. Preheat oven to 325 degrees F. Lightly grease one 9x13-inch pan. In a large mixing bowl combine the oats, flour, baking soda, vanilla, margarine, honey and brown sugar. Stir in whatever you want (chocolate chips, raisins, nuts, etc.) Lightly press mixture into the prepared pan. Bake for 18-22 minutes or until golden brown. Let cool for 10 minutes then cut into bars. Let bars cool completely in pan before removing or serving. Here’s a fairly mild dip that provides protein and fiber. Serve with corn chips, carrot sticks or bell pepper strips. You can also use it as a sandwich spread. Also, it's best made with lime juice, but lemon juice works in a pinch. In a blender or food processor with the machine running, add garlic. Stop machine and add black beans, lime juice, cumin, salt and juice. Process until smooth. Looking for a quick and easy dinner? Did you know Manwich sloppy joe sauce is MSPI-friendly? Just make sure you use MSPI-friendly hamburger buns/sandwich bread. I made the Eggless Chocolate Cake recipe (posted 3/22/08) over the weekend, but instead of using the icing that the recipe calls for, I used this recipe that my mom gave me. It was super decadent and so yummy! In case you're concerned about the alcohol in the Kahlua, don't worry, it boils off. Mix the first four ingredients and bring to a boil, whisking constantly. Remove from the heat, add the sugar and vanilla, stirring until smooth. Drizzle over prepared cake. Don't have time to make pancakes completely from scratch? Bisquick is MSPI-friendly! Just follow the recipe on the box and substitute rice milk for the regular milk.